Wednesday, Jul 25, 2018, 7 – 8 p.m. The UW Department of Genome Sciences played an important role in determining the sequence of the 3 billion letters of DNA specifying all of our hereditary information and is now one of the leading centers where the human genome is being interpreted and where new technologies for this analysis are being developed. 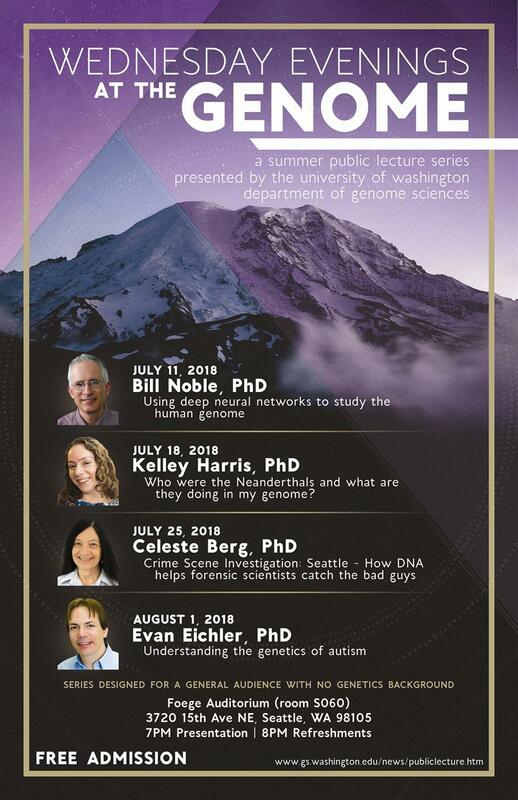 To share these advances with the public the Department of Genome Sciences hosts a 'Wednesday Evenings at the Genome' public lecture series each summer. These exciting discussions assume no background knowledge in genetics or other biological subjects and provide opportunities to chat with our presenters. Admission is free. Presentations begin at 7:00 pm in Foege Auditorium and will be followed by refreshments at 8:00 pm just outside the auditorium.